The 1Malaysia Development Bhd asset recovery team is looking to recover the RM974 million that Datuk Seri Najib Razak had dished out to various local individuals and groups from his main AmIslamic Bank account between 2011 and 2014. The money has been determined to have originated in 1MDB and layered and transferred in numerous transactions to Najib’s bank account. Investigators found that between early 2011 and early 2013, some RM3.217 billion (close to US$1.0 billion at the then exchange rate) ended up in that account. From that sum, Najib paid out — via hundreds of cheques — RM154.88 million to 85 individuals, RM325.03 million to 51 companies, RM469.59 million to 49 branches and divisions of BN political parties and RM24.42 million to 17 non-governmental organisations and foundations. Investigators say the money trail was all there because the payments were via cheques and all those who received the money will be asked to return it to 1MDB. The asset recovery unit has opened a bank account to receive the cash that is recovered, including the eventual sale of the super yacht Equanimity. 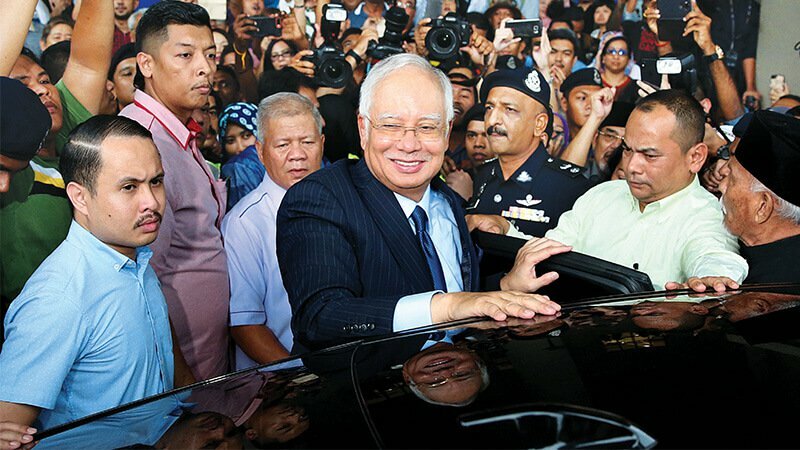 Two businesses, one Umno division and an individual from among those who received money from Najib were named when he was slapped with 25 new money laundering and corruption charges last Thursday (Sept 20). Najib is accused of having paid RM20.1 million to the Batu Kawan Umno division, RM2 million to ORB Solutions Sdn Bhd, RM303,000 to Semarak Konsortium Satu Sdn Bhd and RM246,000 to Lim Soon Peng. Sources say these payments are only the tip of the iceberg as Najib had paid a total of RM974 million from that account. For example, they say, ORB Solutions (which describes itself as a web management and communication strategist) received a total of RM40.65 million from Najib. Its directors and shareholders include Najib’s special officer Datuk Amhari Efendi Nazaruddin and Har Kok Kit. Semarak Konsortium, whose major shareholder is Datuk Mohd Omar Mustapha, a businessman close to Najib, received RM19.59 million. Sources say the company that received the most — RM109 million — is event organiser Solar Shine Sdn Bhd, whose directors/shareholders are Muhammad Zaki Ilias and Mazlan Saidin. Home furnishing firm Jakel Trading Sdn Bhd was paid RM37.16 million while Mascom Communications received RM17.9 million. Najib also paid large sums of money to media consultancies, presumably to shore up his image. Among those that were paid to do work for him is Brandworth Corp, which received RM15.78 million. Its directors include Datuk Seri Ahmad Farid Riduan and Tan Sri Aziz Kassim. Centre For Strategic Engagement Sdn Bhd (CENSE) received RM5.35 million while two of its directors received personal payments totalling RM6.0 million. Another firm, Zeal Hi-Tech Solutions Sdn Bhd, was paid RM13.5 million. Sources say Lim Soon Peng received RM2.35 million in total while Sarawak businessman Tan Sri Bustari Yusuf received the biggest individual payment of RM59 million. Among political parties, Umno received the most (RM415.75 million), followed by MIC (RM20.25 million) and MCA (RM16.5 million). Sources say although those who received money from Najib might not have been aware of the source of the funds and could have been paid for legitimate reasons, they would still be asked to return the money. It is also unlikely that criminal charges will be brought against them, especially if they cooperate with the investigators. On Aug 13, Najib’s lawyer Tan Sri Muhammad Shafee was charged with money laundering and not declaring as income the RM9.5 million he received from the same AmIslamic Bank account.